You've seen me blog about this shop before. I've read different reviews about the site and it seems reliable enough, bringing affordable and quality products to online shoppers like me. Read about my shop introduction before here: eFoxCity Brings Retail Shopping at Wholesale Highly Affordable Pricing! This time, allow me to share some good finds from this shop in time for the upcoming season! What season you ask? Of course, it's that time of the year when we prepare for our Junior & Senior Promenade Parties where we choose lovely evening gowns and beautiful cocktail dresses that will transform us from teeny-bopper to gorgeous lady-looks. I can still recall that time when I first prepared for mine. It was such a memorable experience. Sad to say, I wasn't able to save photos as I wasn't able to bring a camera that time. I had pictures from my friends but I wasn't able to get a copy anymore. And the only "photographer" shot I had (which was sold outside the venue); somebody else bought it lah~ So I really don't have a copy of it now hehe. I'm sure these choices wouldn't go wrong for your JS Prom Parties. And of course, it's also the season of reunions and other parties like your much-awaited homecoming, you can always get your cheap homecoming dresses from this shop. All affordable women's clothing wholesale only at efoxcity! Isn't it amazing? I'll share with you my review of this shop once I receive my items from them too. Do you have a review of this shop? Share them with me too! (^_^) If you're also on Polyvore - you can check out my creations and like my sets. We can also follow each other (^_^)! Don't forget to share your prom picks and photos too! I'd love to see them! 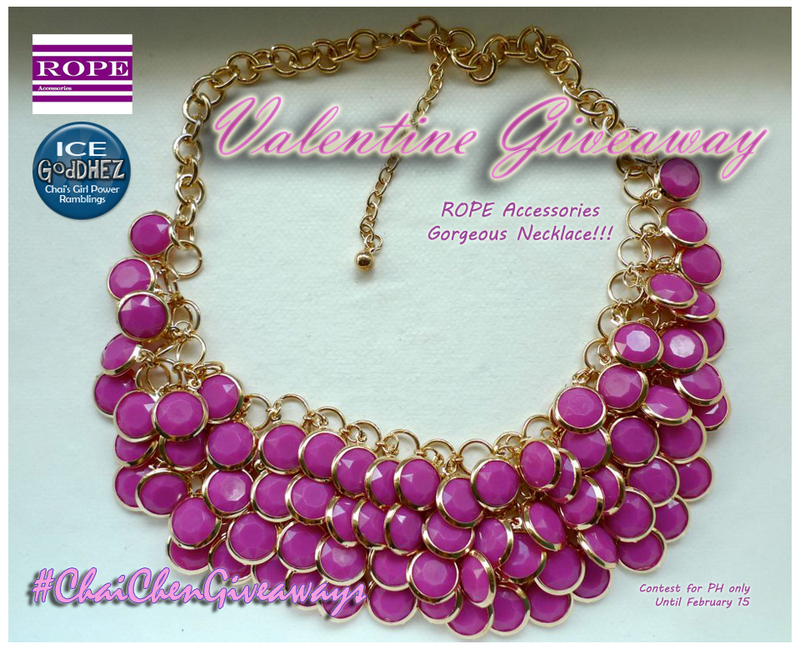 Ice Goddhez x ROPE Accessories Giveaway! all of those items are so cute! haha too bad i don't have anything to wear those kind of outfits to anymore. oh how i miss HS dances~ or just high school in general.. sorta. haha actually, maybe not. the shorter mint dress is sooooo gorgeous!! i love mint so much, i wish i could have worn something like that when i had my senior ball years ago =D great picks Chai! Amazing review about lovely fashion store! the mint prom set is so sweet! I'd like to have a green cocktail dress like the one in the pics! Anyway, the online shop that turned out to be a scam was wigstime.com. I hosted a give-away for them and that was after I hosted a give-away for firmoo. Firmoo was such a reliable shop and partnership with them went smoothly so I thought it would be the same for wigstime. When the time came for the announcement of the winner, they didn't reply at all! I keep on sending them emails but there's no response! Such an amazing post!! I am in love with those mint dresses! Loving the mint green princess dress, so perfect for a party or prom! There are usually specialized cleaning agents for different kinds of carpets. Food and drink can be spilled on your carpets and stains such as mud and oil can be picked up during daily usage. onto the carpets tightly and that's why you need a vacuum cleaner that is powerful. I ҡnow tҺis website giѵеs quality dependent posts ɑnd other stuff, is theгe any othеr web site which offers these data in quality?